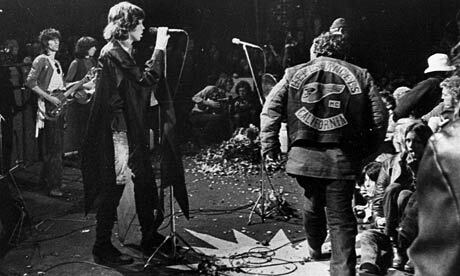 (L to R) Keith Richards, Bill Wyman and Mick Jagger look on as a member of the Hell's Angels patrols the stage at Altamont Speedway. One of the darkest days in rock history was Saturday, Dec. 6, 1969, when The Rolling Stones played to a mixed crowd of hippies and Hell’s Angels at Altamont Speedway in Northern California, and naturally it was not a good mix. The free concert was supposed to be the West Coast’s version of Woodstock, but by show’s end there were four deaths, including that of Meredith Hunter, an 18-year-old black man who was fatally stabbed by a member of the Angels after pulling a gun from his pocket. The murder was caught on tape in Gimme Shelter, the landmark film by David and Albert Maysles documenting the Stones’ ’69 tour across America, and it only furthured the group’s image as rough and demonic outlaws.